We fell in love with the Gaines family a few years ago watching their show on HGTV, "Fixer Upper." I had always been a fan of more modern decor until Joanna sold me on the beauty of rustic decor. As a southern transplant, and Texas resident it seems appropriate that it grew on me. I'd like to think I'm a mix of both now, having added rustic touches here and there in my home. I've made the trip to Magnolia twice now (from Houston), and even indulging in some cupcakes at their bakery around the corner. I was so excited when I was asked to review her new children's book! I knew I had to review it with my kiddos. My daughter loves the idea of gardening, while I have never had a green thumb like my mom. I grew up with hanging ferns and other live plants included in our decor, as well as a garden out back with flowers, multiple tomato plants, cantaloupes, and other fruits and veggies. It seemed so easy to her. Everything I plant seems to not make it, though last year we had some success with my daughter's sunflowers. 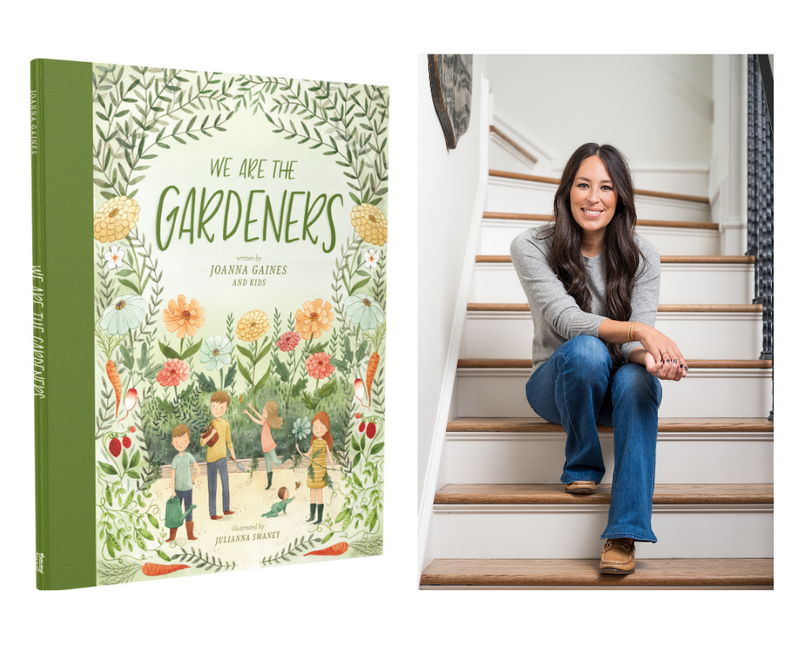 In We Are the Gardeners, Joanna, and the kids chronicle the adventures of starting their own family garden. (Don't worry, Chip is in there too!) From their failed endeavors, obstacles to overcome (bunnies that eat everything! ), and all the knowledge they've gained along the way, the Gaines family shares how they learned to grow a happy, successful garden. As it turns out, trying something new isn't always easy, but the hardest work often yields the greatest reward. There are always new lessons to be learned in the garden! “The garden has always been a place that inspires me. There’s something about digging deep into fresh soil or watching new life burst from what was not long ago just a tiny seed that reinforces what a gift life is,” said Joanna. “I think that’s part of why my kids have come to love spending time in the garden just as much as I do. It can be a great teacher if we pause long enough to notice all there is to learn. Where every day can be a lesson in hard work, and sometimes even in failure, but where there’s also growth worth celebrating. This book is our way of sharing what the garden means to us, and the many adventures we’ve had along the way!" Easy to read and follow. Hardcover. Great length at 40 pages. This is one we will be rereading often. Highly recommend for all the little ones in your life and might make a nice teacher's gift. Looking for other great books for you and your family? Check out our list of recommended reads this year at amazon.com/shop/youngwifemom. Disclosure: We received a complimentary copy of this book in order to review. No other compensation was given or received. All opinions are ours. While this book is available at many outlets, we would love if you purchase through our links as we will receive a small compensation in return.